Thanksgiving and food traditions go hand-in-hand. There are many popular veggies that has to be on a thanksgiving dinner table & a sweet-potato is one of them. These lend a nice, bright color and natural sweetness to the entire spread. Well, I might have the perfect recipe for you which is very easy to put together. Just peel, cut, toss and bake. Not just for thanksgiving, this recipe serves best for any occasion. I admit, am simply in love with these fries and is one of the few recipes which I made two batches, back-to-back. 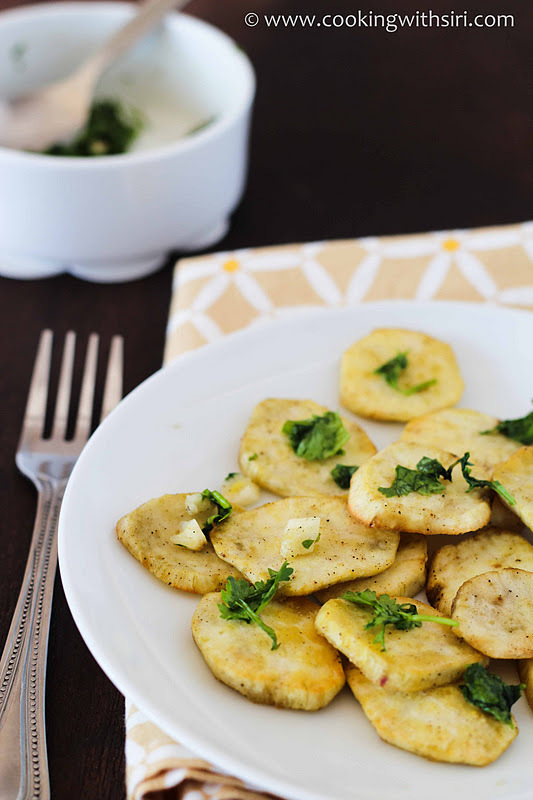 These taste especially good when paired with the cilantro gremolata which gives the dish a vibrant, zesty note. Note: Sweet potatoes are of two popular kinds - in terms of texture & color of their flesh. The ones I used in US are softer and have a orange hue and what I got in my local grocery store are a bit drier, cream-coloured. this recipe works perfectly with any kind of potatoes. 4 medium-sized sweet potatoes, peeled and cut into rounds. 1. Preheat oven to 200 C or 400 F.
2. In a bowl, toss gently sweet potatoes, olive oil, salt and pepper. 3. Arrange the slices on a oil greased baking sheet in a single layer. 4. Bake for 30 minutes (or) until tender, turning the potato slices after 15 mins. 5. 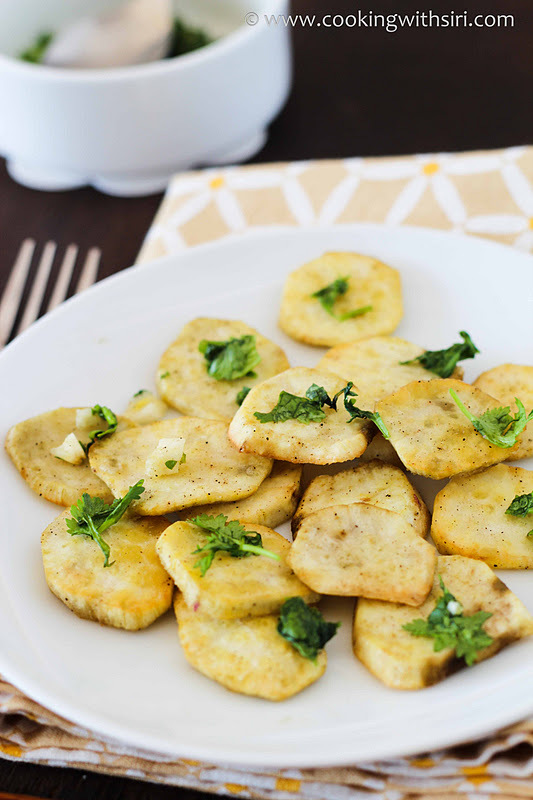 While the potato slices are baking, make the gremolata - Combine cilantro, lemon zest (or) orange rind, and garlic in a small bowl. 6. Sprinkle cilantro mixture on sweet potato slices & Serve. Sending these potatoes to Healing Foods: Vegetarian Thanksgiving event, guest hosted by Sreelu of Sreelu's Tasty Travels. Send in your entries as well and win a chance to own one of two amazing cookbooks as giveaways. Perfect for Thanksgiving. This makes a nice snack... and that too one can make in mins... Good one. excellent photography with nice presentation.. This is what makes me happy in the kitchen, experimenting with old and new recipes. I love to search for recipes and of course try them out. This is a must try...A perfect snack treat which i am sure my little girl will love. Healthy too! thanks for the post! Lovely..Perfect snack for my kids. Can't wait to make them. Just lovely photographs on your blog!